In the increasingly-competitive Quick Service Restaurant environment, Firehouse Subs stands out for at least two reasons. It sells a unique steamed submarine sandwich to a “can’t-get-enough” cult following. Lines often stretch out the door. And its corporate identity – instead of being cooked up in a boardroom somewhere – literally derives from its founders: two retired ex-firefighters. Those owners, Robin and Chris Sorensen, asked Shirley/Hutchinson to build a long-term advertising and marketing platform to help them grow the company into the national powerhouse it’s destined to be. 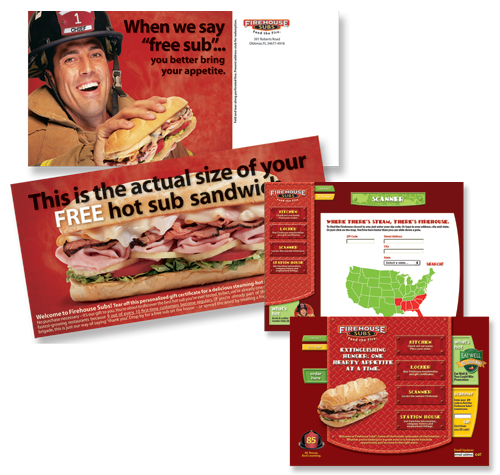 We started with a positioning line that plays directly into their customers’ behavior: “Feed the fire.” We added a comprehensive franchisee brochure, a robust new website and a variety of coordinated collateral materials. Perhaps most importantly, we delivered quarterly promotions that broke records: the last direct-response mailing pulled an amazing 12% redemption. They created a great product. We turned up the heat.